Thank you for taking to time to visit our Buchanan Sisters Appeal page. This appeal was launched in 2011. The Friends of Glasgow Necropolis are pleased to announce that this appeal has now closed as the target figure was raised. Work on the restoration of the Buchanan Sisters mausoleum commenced in early 2013 and is due to be completed by May 2013. A big thank you to everyone who made a contribution to the appeal. This wonderful Mausoleum within the Glasgow Necropolis is the final resting place of the philanthropic Buchanan Sisters of Bellfield Estate, Kilmarnock. This mausoleum deteriorated substantially over the last one hundred and fifty years and required £46,000 to restore it to its former glory. 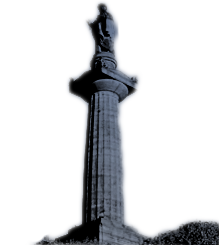 The Friends of Glasgow Necropolis raised £20,000 of this figure. The imposing monument to the memory of Margaret, Jane and Elizabeth Buchanan who were beautiful, unmarried and wealthy but spent their fortune,which is the current equivalent of £4m today, on improving the lives of the sick and poor especially of the name Buchanan. They supported many charities and individuals including a significant bequest for the building of a hospital in Glasgow, now known as the Royal Infirmary. The gallery below shows not only the progress of the Buchanan Sisters Mausoleum restoration but the restoration of other neighbouring mausolea.